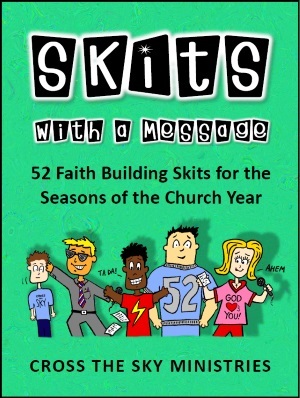 Skits With A Message includes 52 skits for family and youth ministry. There are skits for every season of the church year, including Advent, Christmas, Epiphany, Lent, Holy Week, Easter, Pentecost, and Thanksgiving, plus many more. Each skit includes scripture texts, a brief message, discussion questions, and a prayer. Everything you need for a great presentation! All of the skits have been tested and performed in a real congregational setting for youth Sunday services, family events, youth retreats, children’s messages, and special seasonal church events. Themes focus on important faith topics, such as welcoming visitors, servant leadership, community life, family devotions, forgiveness, prayer, peacemaking, social media, global missions, accepting others, the Gospel message, God’s grace, and following Jesus. We hope you enjoy this collection of new skits from Cross the Sky Ministries! Skits With A Message: Price $19.95. Shipping cost of $6.45 will be added to your order at checkout. We ship materials via priority mail, which takes 2-3 business days to deliver.